Up to seven Onia® lights can be registered and controlled. The brightness is steplessly adjustable with the smartphone app. Due to your individual biorythm specially developed algorithms calculate the color that emotionally, cognitively and physically supports you precisely at this moment. ONIACOLOR offers 196 color combinations, separated for both cubes. 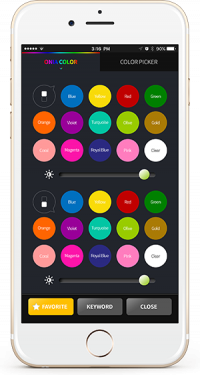 COLORPICKER (Onia® mini only) You can choose from 16 million colors. Explanation and meaning of the Onia® colors for adults and children. In the Color Favorite mode, you can save your own personal colors. The timer function turns off your Onia® at the set time. You can wake up with the timer function in the morning (only Onia® mini). Shake your smartphone and Onia® changes the colors quickly and randomly. Manual Control Using the buttons on the lamp base Onia® can be controlled also manually at any time.